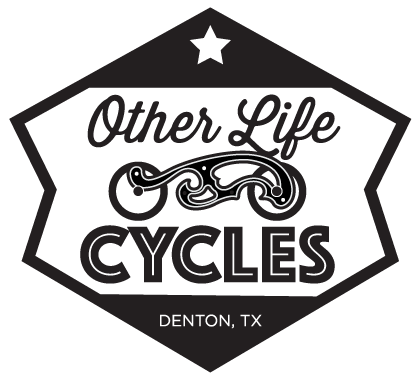 The Denton Independent Motorcycle Show is a not-for-profit event that promotes the art of custom motorcycles as well as the Downtown Denton area. We are as passionate about motorcycles as we are about our home town and its local scene. The broad appeal of the show and close proximity to the DCTA commuter train will bring in attendees from beyond the local Denton area, making this a great opportunity to expose them to what Denton has to offer. Your support helps to ensure that our event is successful. Donations can be offered as financial assistance or in-kind contributions. This year we are partnering with the Greater Denton Arts Council and a portion of our proceeds will go to support the fine art community in Denton. To sponsor our show, contact us through the contact form below or go directly to our sponsorship payment site. Sponsor Banner – Your business logo* will be presented proudly on a banner hanging in the venue. Banners will be large and prominently displayed in the main gallery. Staff T-Shirts – All volunteer staff will be provided with uniform T-shirts and will be required to wear them throughout the event. Your business logo* will be presented proudly on the T-shirts for all attendees to see. Web & Print – Your business logo* will be displayed on all print promotional material as well as proudly listed amongst our sponsors here on our site. We will also be thanking all sponsors over on our Facebook page. To sponsor us at this level, visit our sponsorship payment site and select the $1,100 level. To sponsor us at this level, visit our sponsorship payment site and select the $550 level. To sponsor us at this level, visit our sponsorship payment site and select the $275 level. * All logos must be presented to the event coordinators prior to September 15, 2018. Vendor Booths will be available for all day Saturday, October 13 in limited capacity. You may reserve a space in advance by contacting us through the form below. Due to limited space, all vendor requests will be evaluated on a case by case basis to best represent the show and Denton. To sponsor us at this level, please contact us through the contact form below. Denton Independent Motorcycle Show is a non-profit organization and all sponsorships are considered tax deductible, charitable donations.